KHARTOUM, Sudan - Meriam Yehya Ibrahim, 27, has until Thursday to either denounce her Christian faith or face a death sentence. When Ibrahim’s father, a Sudanese Muslim, abandoned her at age six, her mother, an Ethiopian Orthodox, raised her as a Christian. Ibrahim identifies herself as a Christian, but despite this she is considered by the courts to be a Muslim, as her father was. She was reported by a family member in August 2013 and was arrested on charges of adultery. Ibrahim has been convicted by a Khartuom court for abandoning her Muslim faith in favor of Christianity, an action that, under Sharia law, indicates that she committed adultery with her husband, a non-Muslim. Because the law considers her a Muslim, her marriage to a Christian man is considered void and adulterous. Marriage to a non-Muslim man is prohibited for Muslim women. Ibrahim and her husband have a 20-month-old son and she is expected to give birth to her second child sometime next month. In past cases involving pregnant women, the Sudanese government has waited until the woman gave birth before executing a sentence. If sentenced to death she will likely be flogged with 100 lashes then hanged. The blatant disrespect for freedom of religion and interference in the personal life of Sudanese citizens is outraging people in Sudan and abroad. Authorities have closed Khartuom University indefinitely after Sudanese students there mounted a protest begging for the end to human rights violations, more freedom, and better social and economic conditions. In Khartuom, foreign embassies are urging the government to rethink its decision. A joint statement issued from the embassies of the United States, Canada, the United Kingdom and the Netherlands says, “We call upon the government of Sudan to respect the right to freedom of religion, including one's right to change one's faith or beliefs, a right which is enshrined in international human rights law as well as in Sudan's own 2005 Interim Constitution. We further urge Sudanese legal authorities to approach Ms. Meriam's case with justice and compassion that is in keeping with the values of the Sudanese people,” the joint statement read. DARFUR, Sudan - When South Sudan gained its independence in 2011 after decades of struggle and strife, many citizens and international onlookers felt a sense of hope and relief that the dueling sides of Sudan would finally have their own national government and boundaries to consequently move towards peace and stability. However, the trajectory since secession has been anything but smooth and easy, and citizens of both countries continue to experience violence and broken promises on a daily basis. This also applies to the situation in Darfur, which despite massive international campaigns for aid and awareness, still proves to be a volatile region of Sudan. Displacement and murder are unfortunately no stranger to the region, and are being brought to light again as tensions flare between the Rizeigat and Ma'alia tribes. Since the start of August, hundreds have been killed from both sides of the clashes as each fight over land and power. The situation is increasingly complicated as the governments of Sudan and South Sudan are known to have been tied to feuding factions in Darfur, which exacerbates the conflict and helps it to continue. 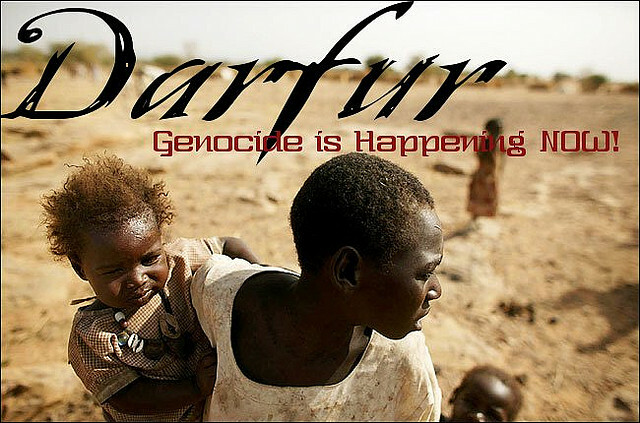 The dangerous nature of the state of Darfur cannot be mended or even abated until the central government brings the perpetrators to justice and peace to the region. International aid workers and volunteers could help with this rebuilding, however their lack of support inhibits their ability to help. Just recently, unidentified gunmen raided an office of the American Refugee Council in Nyala. This clearly hinders the ability of outsiders to offer their assistance to the situation, and this cannot be improved until the central government steps in to provide security and safety for the region. KHARTOUM, Sudan - Intisar Sharif Abdalla, a young Sudanese woman has been sentenced to death by stoning for the alleged crime of adultery. She was sentenced by an Ombada criminal court but is being held in the capital while her case is under appeal according to Reuter’s news agency. Abdalla is the latest woman to become ensnared by would be arbiters of moral turpitude within the Islamic world. These men routinely condemn people under Sharia law to punishments ranging from flogging to stoning. Convictions and sentencing of women for alleged sexual crimes has become increasingly prevalent in East and West African countries where extreme Islamist are coalescing their power base and instituting Taliban like rule over the populace. In Abdalla’s case, she has also fallen victim to the confluence of events that led to the succession of South Sudan last year. South Sudan's population practices a variety of beliefs including Christianity and indigenous practices, whereas Sudan is ubiquitously Muslim. During her trial by the Ombada court, she could not assist her lawyers in mounting any defense because she does not speak Arabic and an interpreter was not provided for her. Additionally, according to Reuters she is illiterate and her nationality has not been confirmed. She could have been a refugee fleeing one of the numerous conflicts that continue to plague either Sudan or South Sudan, or one of the neighboring countries. Humanitarian groups, such as Human Rights Watch have sounded the alarm and brought Abdalla’s plight to the attention of the world. In addition to her rights being violated as a woman, her infant son is imprisoned with her as she awaits the outcome of her 22 April 2012 conviction. Sudan began moving toward a more stringent interpretation of Islamic law following a 1989 coup. Ten years later in Northern Nigeria, Islamic extremists like Boko Haram implemented Sharia law with the desire to supersede existing legislative statutes codified by a non-religious government. Like Northern Nigeria which seeks to usurp and replace existing laws with Sharia, President Omar Hassan al-Bashir committed to the adoption of a fully Islamic constitution following the secession of the south. "If south Sudan secedes, we will change the constitution and at that time there will be no time to speak of diversity of culture and ethnicity," Bashir told supporters at a rally in the eastern city of Gedaref. Nigeria and now Sudan have had cases in which Islamic Sharia courts have sentenced women to death by stoning. In Nigeria both Safiya Hussaini and Amina Lawal were sentenced for adultery, but after international pressure and global outcry, each of the women was subsequently freed. However, while incarcerated they faced the prolonged threat of a horrible death, the possibility of being murdered extra judicially, as well as the psychological stress of living at the mercy of irrational misogynists. Abdalla’s case will hopefully be dismissed or her sentenced commuted, which according to Fahima Hashim, a women's rights activist, is a real possibility because previous stoning sentences in Sudan had not been carried out. If Abdalla could comprehend the complexity of case and its potential outcome, it would provide scant relief, and for now we can do little more than wait with her. South Sudan. Newest Country. Newest Colony? 10 July 2011 - Last year we reported on Land Grabs in Ethiopia and earlier this year we featured a post on Neo-Colonialism in Africa. Yesterday, South Sudan became an independent country poised to become the 193rd member of the United Nations. Simultaneous to its creation representatives from multinational corporations have begun to pour into Juba, the capital of the fledgling nation. The number of foreigners arriving is so noticeable that locals have begun to complain. Foreign powers invading and carving up Africa in order to exploit its land and resources is well-known practice. In the 19th Century the era of European Colonization began in Africa. At that time, the major players were the United Kingdom, Germany, France, Italy, Portugal, Spain and Belgium. These countries arbitrarily sectioned off areas of the continent without consideration of tribal or familial connection. In South Sudan representatives from Chinese and Lebanese multinationals and smaller companies from Eritrea, Ethiopia, Uganda, Kenya, and Zambia are a few of the countries seeking to establish a strong hold in the newly formed country. In the wake of the announcement of the nascent state's formation these Neo-Colonialists have begun a process which will ultimately result in a transformation of the country. Like many underdeveloped areas of Africa, Juba's dirt roads are crowded with pedestrians carrying impossibly large loads on their heads. People transporting firewood, water and produce for sale. They traverse the country via dusty pathways and compete with large horned cows for minimal space to either side. Because inhabitants of the country have been engaged in war and survival they are ill-equipped to work the emerging economy. Thus, it is a certainty that most of the Southern Sudanese people will be relegated to service level job as domestics, cooks, drivers or resort to criminal activities such as prostitution, drugs robbery and murder. Under colonialism these were the only positions available to the indigenous people and they rarely if ever had the opportunity to advance. While living in Nigeria as a child, I recall the slow transformation of the country as the oil wealth poured into its national coffers. Unfortunately, the petroleum companies transferred the profits of the 'black gold' back to their countries of origin and the remainder to government official to ensure continuity of service. Corruption in many African countries is pervasive and an expected cost of doing business. In Nigeria bribes to government officials are used to encourage them to turn a blind eye to the adverse environmental impact of petroleum pollution to the surrounding territory. When the British Petroleum (BP) oil spill occurred off the coast of Louisiana in the Gulf of Mexico the world was justifiably horrified. However, on the Nigerian Coastal environment, large areas of the mangrove ecosystem have been destroyed. Oil spill has also destroyed farmlands, polluted ground and drinkable water and caused drawbacks in fishing off the coastal waters. There has been continuous regional crises in the Niger Delta area as a result of oil spill pollution of the coastal ecosystem. Between 1976 and 1998 a total of 5724 incidents resulted in the spill of approximately 2,571,113.90 barrels of oil into the Delta region environment. Some major spills in the coastal zone are the GOCON’s Escravos spill in 1978 of about 300,000 barrels, Shell Petroleum Development Corporation’s (SPDC’s) Forcados Terminal tank failure in 1978 of about 580,000 barrels, Texaco Funiwa-5 blow out in 1980 of about 400,000 barrels, and the Abudu pipe line spill in 1982 of about 18,818 barrels (NDES, 1997). Despite these gross violation of human rights and environmental protection, there is rarely any outcry from the global community about these abuses. I distinctly remember walking along the pristine beaches of Tanzania and every so often I would encounter globules of oil washed up on the shore. As I lifted my gaze from the globules at my feet toward the horizon I saw a mirage like view of a moored oil tanker. The captain and its crew routinely stopped off the Tanzanian coast to clean the tanks and jettisoned the waste into the Indian Ocean. Were this to occur anywhere in the Western world there would be a cacophonous outcry but this is rarely the case in Africa. Given this track record of egregious violations by petroleum companies operating in Africa we can only hope and watch as South Sudan develops its economy based on its most valuable resource. NEW YORK - Yesterday, 5 July 2011, United Nations officials announced that South Sudan could become a member state after seceding. South Sudan's secession was a prerequisite set forth by the U.N. Secretary General Ban Ki-Moon for it to be considered for membership. On 9 July 2011 the Council will vote to confirm South Sudan as the 193rd member state and barring no veto, it could be confirmed as a member state on July 14. However, for over a decade this conflict-ravaged region has been subject to violent civil war and genocide in addition to the battle for control of its rich oil-producing regions. Because of this instability the future state shall remain under U.N. guardianship for the foreseeable future. U.N. Secretary General Ban Ki-Moon said in a statement late on Tuesday he was disappointed there had not been an end to hostilities in South Kordofan, the north's main oil state which borders the south. Similar to the global outcry against the holocaust in Darfur, the continued hostilities have been condemned by Ban Ki Moon and others. The U.N. Secretary General has demanded the cessation of conflict as it imposes a "grave humanitarian impact" on an already victimized and weary population. As part of the U.N.'s preparation to assume guardianship over South Sudan, the international peace keeping organization is expected to deploy up to 7,000 U.N. peace keepers in the new state. This mission is tentatively called UNMIS, which will be the fourth separate blue-helmeted force in Sudan. The others were for Dafur, Abyei in response to the genocide and to monitor compliance with the 2005 north-south peace deal that ended decades of civil war.